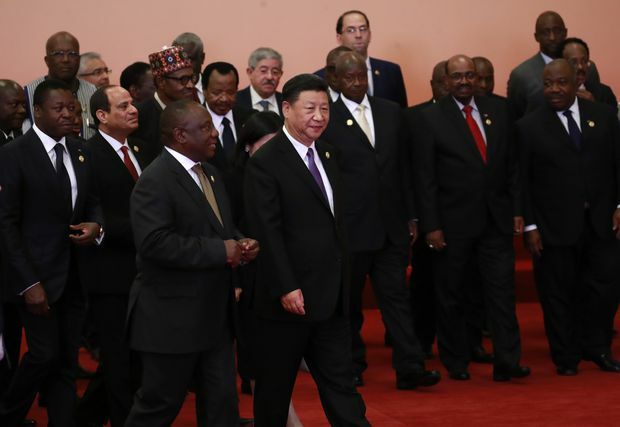 Chinese President Xi Jinping (front centre), South African President Cyril Ramaphosa (front, third from left)), Egyptian President Abdel Fattah al-Sisi (front, second from left), Togos President Faure Gnassingbé (front left) and other African leaders walk together after a group photo session during the Forum on China-Africa Cooperation 2018 Beijing Summit on Sept. 3, 2018 in Beijing, China. Speaking at the opening of a major summit with African leaders, Mr. Xi promised development that people on the continent could see and touch, but that would also be green and sustainable. China has denied engaging in "debt trap” diplomacy, and Mr. Xi’s offer of more money comes after a pledge of another US$60-billion at the previous summit in South Africa three years ago. Mr. Xi, addressing leaders at Beijing’s Great Hall of the People, said the new US$60-billion will include US$15-billion of aid, interest-free loans and concessional loans, a credit line of US$20-billion, a US$10-billion special fund for China-Africa development, and a US$5-billion special fund for imports from Africa. Chinese companies will be encouraged to invest no less than US$10-billion in the continent in the next three years, he said. Government debt from China’s interest-free loans due by the end of 2018 will be written off for indebted poor African countries, as well as for developing nations in the continent’s interior and small-island nations, Mr. Xi said. China will carry out 50 projects on green development and environmental protection in Africa, focusing on fighting climate change, desertification and wildlife protection, Mr. Xi said. Speaking earlier at a business forum, Mr. Xi said China had to be careful about where money was spent. Chinese officials say this year’s summit will strengthen Africa’s role in Mr. Xi’s Belt-and-Road initiative to link China by sea and land with Southeast and Central Asia, the Middle East, Europe and Africa through an infrastructure network modeled on the old Silk Road. Mr. Xi said the plan, for which Beijing has pledged US$126-billion, would help provide more resources and facilities for Africa and would expand shared markets. China loaned around US$125-billion to the continent from 2000 to 2016, data from the China-Africa Research Initiative at Washington’s Johns Hopkins University School of Advanced International Studies shows. Mr. Xi told him on Sunday that "foreign forces” should not interfere in Sudan’s internal affairs, China’s Foreign Ministry said. China is not a party to the court. "China has always had reservations about the International Criminal Court’s indictment and arrest order against Sudan’s president. We hope the ICC can prudently handle the relevant issue,” Foreign Ministry spokeswoman Hua Chunying told reporters.